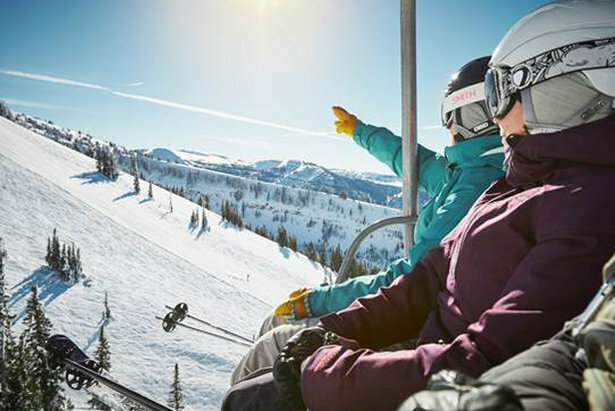 Enjoying the sights from the chairlift at Grand Targhee Resort. The conditions are beyond perfect yet again here in the Tetons with deep, fresh powder—351 pristine inches to be exact—and several days of bluebird skies are in the forecast. The locals are eating it up, and the good news is, there’s plenty to go around. Our legendary mountains feature some of the biggest and baddest terrain for shredding in the world, so finding a fresh slope won’t be a challenge. The terrain, however, promises to keep you on your toes. The Jackson Hole Mountain Resort, Grand Targhee and Snow King all emerged the clear winners in accumulation in the latest pounding of regional snowfall, and more is on the way. But the rare combination of fresh pow, a ridiculously deep base, and a string of consecutive bluebird days makes this a definite can’t-miss adrenaline adventure. Did we mention we’ve got a rare temperature inversion happening to boot? A rad inversion means you’ll enjoy warmer temperatures the higher up on the slopes you venture. And as if the deal needed any more sweetening, right now we’re offering a $200 flight credit for all the truly devoted and fast-acting alpine shredders out there. What’s more is you can be on the snow in just minutes from the beautiful Jackson Hole Airport—something that very few shred destinations can lay claim to. Whether you ski, board, spa, shop, après or just enjoy watching the snow fall, Jackson Hole is absolutely the only place to be this time of year. Don’t wait—book your getaway and lift tickets now.